I've got a new neighbor that has been keeping me pretty busy lately. With his all night long parties that continuously awaken me between 11 and 1 am you'd think I could call the cops and get his stuff shut down. Because my new neighbor is a skunk. 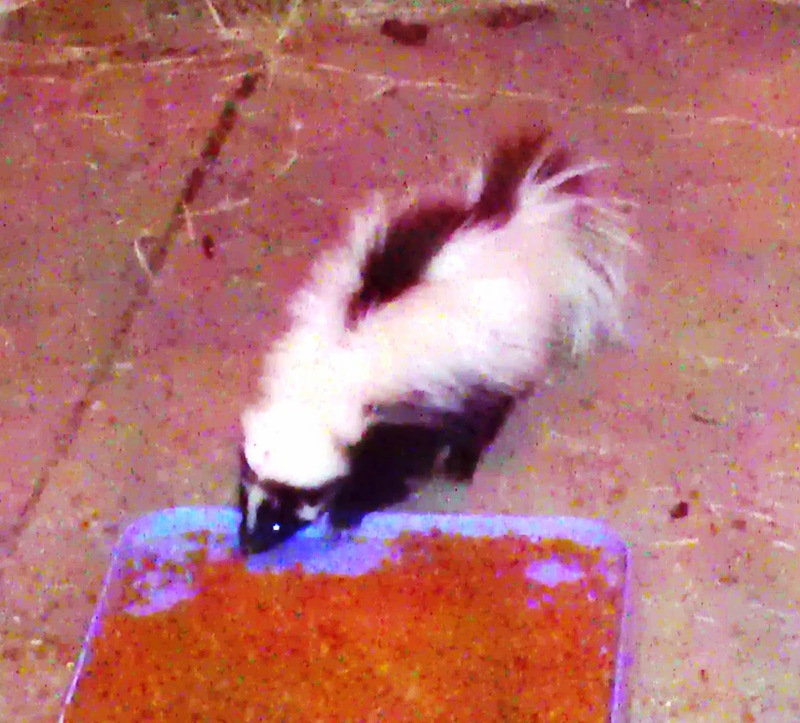 Yes, a skunk. I adore skunks. I think they're adorable, and have even been known to cry over them when they get into tussles with Susan the Skunk dog. Really! I love watching their little koosh ball tails shuffle around in the horse barn. They're totally precious. I'm generally a live and let live person. But no more. You see, this new neighbor of mine "goes off" every single night. He has been for about a week and a half now! I had to have my coworker smell my hair because my nose has been so accosted by this little sucker that I literally smell skunk everywhere I go. I will be sound asleep and then a stench so bad I can taste it (yes, yes, that's actually a thing) will awaken me and cause my eyes to water and me to desperately try to asphyxiate myself with a pillow. I have rigged skunk traps, but they have been unsuccessful thus far. Also, Thank you Google, but moth balls and vinegar soaked rags apparently do not drive skunks away like crosses and holy water do demons in bad horror flicks. The power of Febreze compels you! Ugh. I was hoping to catch him in a live trap and re-home him somewhere where his perfume wouldn't be so noxious, but I've gotta say... I'm getting desperate. Maybe it is the lack of sleep. Maybe it's the taste of skunk flavoring my mouth at one am. Maybe it is the fact that every time I turn on my dryer I have to rewash everything because the poor darling gets startled. One way or another, this skunk has got to go. Not this actual skunk. This was actually a good skunk. This was the late, great Hambone, may he forever eat dog food in the sky. I almost had him tame. Great, now I'm rambling. I need sleep.